Husband and I scored a sweat deal on a ham. Let’s hear it for seasonal grocery shopping! Later we found out why our ham was on such a good sale. Our ham was covered in fat. Odd because hams are from the pig’s legs and are typically lean. Apparently Porky didn't like to exercise because his leg was thick with fat. Ham fat. I tried to cut just the fat off the ham but a little meat wanted to come along for the ride in spots. Husband and I don’t want to eat this much ham fat but it is a shame to throw it out. I can’t compost meat so that’s out. I wonder if I can render ham fat into lard? Is that even possible? Don’t you need fat that comes off a special part of the pig to make lard? Fatback – The fat on the back of the pig. So that’s what fatback is! It is news to this Yankee. 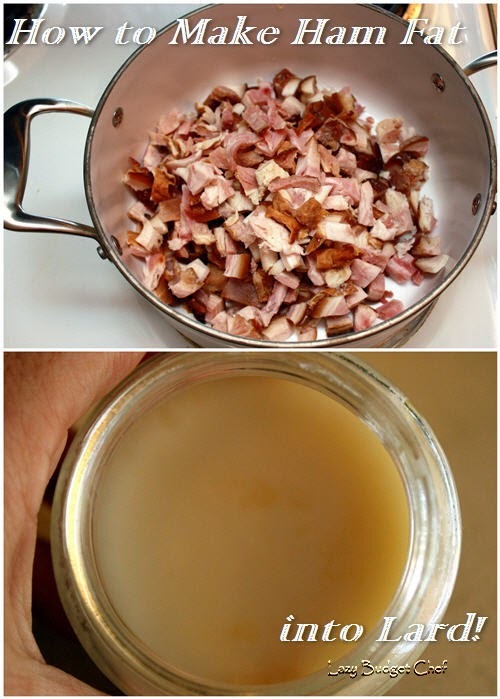 Leaf lard – The fat around the pig’s kidneys. Belly fat – The fat under the pig’s stomach. There seems to be as many strong opinions about which type of pig fat makes the best lard as there are web pages on the Internet. Absolutely none of them said anything about rendering ham (leg) fat into lard. I decided to throw caution to the wind and try this kooky experiment. If it works, I filled a drizzly weekend with a kitchen project that didn’t burn down the house. If it doesn’t work, I’ll get a funny blog post about how I screwed up and earful from the lard rendering purists. Slow cooker - I like this slow cooker best! 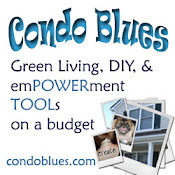 A long time – I’m using the crock pot to render lard because I don’t want to babysit it for hours on end but you can use a pot on the stove at low heat if you like. 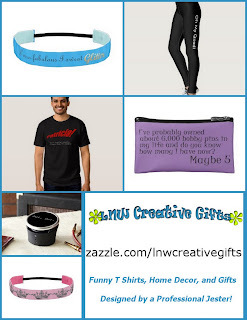 Disclosure: I am including affiliate links for your convenience. 1. Put the ham fat in the crock pot and cover it with water. After a few tries, I went with enough water to just cover the top of the fat in the slow cooker. Too little and it didn’t render well since I have bits of meat in mine. Too much water will water down the finished product and not give you as much lard as you should have. 2. Turn the slow cooker on low and render the lard (i.e.. slow cook the fat at a low temperature for ever) for approximately 8 hours or until the fat has melted. 3. Strain the rendered fat from the lard and ham broth mixture using a fine strainer. I strained my lard and ham broth mixture several times because I didn’t expect the meat bits to make broth. First I strained the big bits from the mixture using the strainer you see below. Next I stained the ham broth and lard mixture through the reusable basket coffee filter like this one I use to strain homemade stock. My reusable coffee filter wasn’t fine enough. Eventually I lined the coffee filter with a clean paper towel because I don’t have paper coffee filters. I set it aside to filter through and then Husband poked his nose in my project. He saw the strained lard in the coffee filter and tossed it because he though I was straining the mixture to make stock instead of lard. Grr! 4. 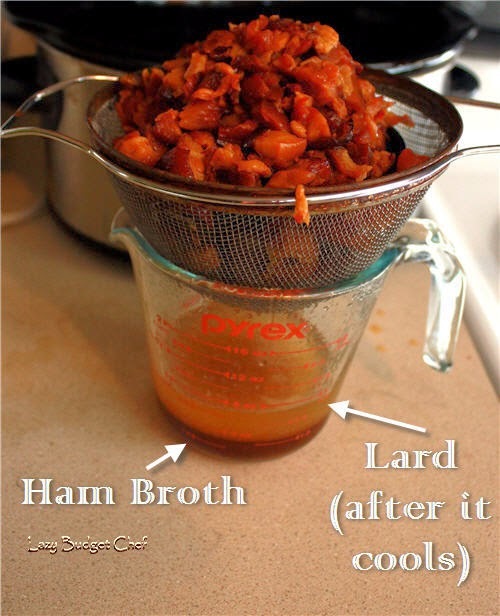 Separate the lard from the liquid the lazy way! Pour the strained lard broth into a jar or bowl and allow it to cool in the refrigerator. The lard will solidify at the top of the bowl. 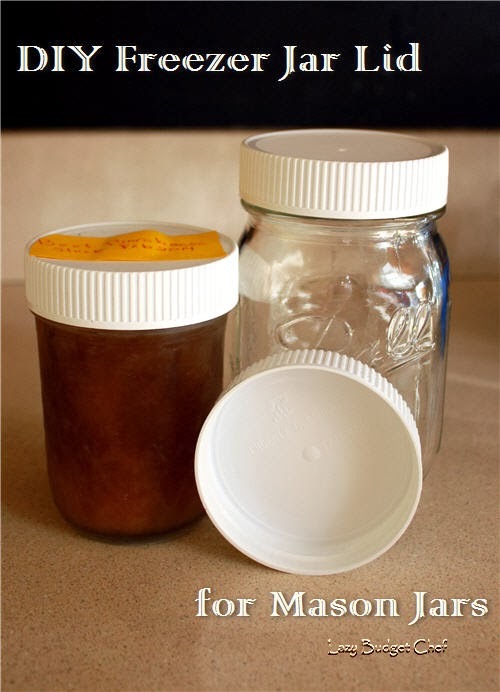 Use a spoon to scoop the lard from the top of the bowl and into a separate jar or lidded container. I guess I can add make lard to the skill section of my resume, huh? If you have enough ham broth liquid at the bottom of the bowl, feel free to put the broth in a separate container and freeze it for later. Learn more about my DIY freezer lids for mason jars here. 5. Store the lard in the refrigerator until you are ready to get cookin’! I avoid food cooked with lard but after all that work, I wanted to cook with it just this once. I used the lard to make biscuits and added enough coconut oil in the recipe to make up for the lard Husband accidentally threw away. That made my biscuits taste more coconuty than like the country biscuits I imagined. They were still good though. Do you cook with lard? What do you make with it? The older members of both of families have a history of heart disease. We have examples of people with our DNA who followed the recommended heart healthy diet that is low in saturated fat and had fewer medical issues. We also have examples of the scary consequence of not following a low saturated fat diet. Since I’m too lazy to deal with all of the doctors and appointments poor health requires, I get my fats from sources like olive oil instead of lard. So far Husband and I have relativity few and minor health issues as a result. Sometimes our doctors run our tests twice because the numbers are so good and given our family histories, they often think they made a mistake . Not eating a steady diet of solid fats is what we think is best for us which may be different for you and that’s OK. There is room for all eating philosophies in my kitchen as long as everyone is nice about it.